15 December, Professor Davidson Don Tengo (D. D. T.) Jabavu, Prixley Ka Isaka Seme, President of the African National Congress (ANC), Africans from different political spectrums and from all sections of South Africa convene at Community Hall, Bloemfontein. Under the chairmanship of Prof. Jabavu, delegates draft comprehensive resolutions on African grievances and resolve to constitute the All African Convention (AAC), an organised body that intends to promote African rights through boycotts. The AAC chooses Bloemfontein because of its historical significance, as it was here on 8 January 1912 that the South African National Native Congress (SANNC) was founded. (This happens at the same time that Afrikaners are celebrating the ninety-eighth anniversary of the Voortrekker victory over the Zulus at the Battle off Blood River in 1838). 15 December, The All African Convention delegates arrives on a Sunday morning and registers with the local committee at the office of Thomas. M. Mapikela, Chief Headman of all Bloemfontein locations. 15-18 December, Proceedings and resolutions of the All African Convention (AAC) take place. It is agreed that All African inhabitants of the union to observe Sunday, 19 January 1936 as a day of universal humiliation and intercession in their places of worship, public gatherings. Prayers are to be offered for God's guidance and intervention of the pending disfranchisement of the Cape Natives by the Parliament of South Africa. The following resolutions by Mr. L. T. Mtimkulu is carried out:-That the resolutions on the Representation of Natives Bill and Native Land and Trust Bill be submitted to parliament by a deputation of Africans during the next session of parliament.-The said deputation to present the viewpoint of the AAC held at Bloemfontein on 16 December, At the bar of the House of Assembly, the deputation is instructed to submit to parliament that in its opinion (AAC), no permanent or peaceful solution of the franchise or land question is possible unless it is the result of mutual agreement between representatives of White and Black races, which is only possible by means of a round-table or similar conference. 16 December, Those present at the All African Convention (AAC) are Dr. John Langalibalele Dube, Rev. Z. R. Mahabane, Dr. Alfred Bitini (A. B.) Xuma and Dr. James Sebe (J.S) Moroka, J. B. Marks, Edwin Mofutsanyane of the Communist Party of South Africa(CPSA), Clements Kadalie of the Industrial and Commercial Workers Union (ICU), tribal chiefs (members of the Transkei Bunga), respected church dignitaries, elected members of the Urban Advisory Boards, prominent women, professional men, and representatives of a score of local organisations, including Coloureds from left-wing circles in Cape Town. The All African Convention's (AAC) discussion focuses on the pending Native Bills, but most of the discussions by the delegates are directed to the entire post-union trend of government policy. The Native Representative Council (NRC). The NRC is regarded as unacceptable. The proposals, which are contained in the Native Trust and Land Bill, are rejected as in unsatisfactory and inadequate regarding demands for African land. The All African Convention (AAC) demands reconsideration of oppressive laws such as the Riotous Assemblies Act, the Native Service Contract Act, Poll Tax Act, and the Pass Laws. John Gomas, a Cape Town Coloured Communist proposes that mass protest meetings be organised throughout South Africa in opposition in opposition of these Acts. The All African Convention's Executive Committee deputation led by Professor Davidson Don Tengo (D. D. T) Jabavu meets with Prime Minister Barry Hertzog and other government officials in Cape Town. Their discussion centres around the acts which segregated and limited African rights and were passed in South Africa in 1935. Hertzog offers a compromise: the retention of the Cape African Franchise but the removal of all registered African voters from the common voter's roll where they would vote for the same candidates as the Whites but a separate roll would be established in order to elect three White members to the Cape Provincial Council. Prime Minister Barry Hertzog refuses to allow postponement in the passing of some of the Bills and having some aspects of the Act looked at again. The All African Convention (AAC) deputation led by Professor Davidson Don Tengo (D. D. T) Jabavu reaffirm its opposition to the Bills in the strongest possible manner as it did in its meeting in December 1935. Selby Msimang, Secretary General of the All African Convention (AAC) expresses his view in an article published in The Crisis. He argues that Parliament and White South Africans have dispossessed Africans of their belongings and toyed with their loyalty. It is found that the All African Convention (AAC) has a budget of 100 British Pounds. The bulk of which was spent on printing conference minutes. Max Yergan is elected All African Convention (AAC)'s secretary of External Affairs after leaving South Africa for New York. 14 February, The All African Convention (AAC) holds a public meeting where they decide they will not accept any compromise regarding the mandate from the December 1935 Bloemfontein convention. They also plan to issue a unity resolution outlining the AAC position; Umteteli wa Bantu (The mouthpiece of the African people) beat them publishing their intended press release to the masses before they could disclose it. 15 February, The All African Convention (AAC) passes a resolution regarding the abolition of the Cape Native Franchise. Umteteli wa Bantu (The mouthpiece of the African people) reports that the delegation that went to Cape Town led by Professor Davidson Don Tengo (D. D. T.) Jabavu made a compromising agreement with General Barry Hertzog. Jabavu's acceptance of the separate voters' roll signalled the end of his political career as he lost respect within the All African Convention (AAC) Executive Committee. The blame was laid entirely on him. March, Professor Davidson Don Tengo (D. D. T.) Jabavu issues a statement through the South African Institute of Race Relations (SAIRR) denying that the All African Convention (AAC) did not accept a compromise Bill. April, Professor Davidson Don Tengo (D. D. T.) Jabavu writes to Jan Hofmeyr thanking him for voting against the Representation of Natives in Parliament Bill. The Bill was passed by a vote of 168 to 11. June, The Communist Party newspaper Umsebenzi (The Worker) backs Umteteli wa Bantu (The mouthpiece of the African people) that the All African Convention (AAC) is wasting time on things of less importance. The Communist Party of South Africa (CPSA) sees the AAC as a parliament for Africans, and wants action, unity and leadership. 3 June, The "Programme of Action" which the All African Convention (AAC) adopts is not what the General Secretary Selby Msimang was anticipating. He resigns from the AAC and joins the African National Congress (ANC). 29 June, The All African Convention (AAC) reconvenes two months after the passing of the Native Bills into law. Professor Davidson Don Tengo (D. D. T) Jabavu, is elected president of the AAC and address the meeting. December, The All African Convention (AAC) states that:-The AAC hereby expresses its utmost condemnation of the savage and the unprovoked and unwanted attack made by Italy upon Abyssinia (later renamed Ethiopia) and declares as its considered opinion that the ruthless action of Italy can only be regarded as large scale violence against fundamental human rights.-Further the convention sees in this action of Italy a continuation of the game of grab, which the imperialist nations of Europe have played in this continent whereby millions of inhabitants have become deprived of their land, exploited and robbed of their labour.-The convention hereby declares its conviction that imperialism, which has thus resulted in the ruthless destruction of African culture, is an evil force to be exposed, condemned and resisted.The AAC further declares that:The AAC recognises the value and desirability of establishing contacts with Africans and African organisations in other parts of the world. To this end the AAC believes that a call to an international conference of Africans and international people of African descent should receive serious consideration by its Executive Committee. June, The All African Convention (AAC) recognises the 1936 Representation of Native Act as the accepted mouthpiece for Africans in their various representative state chambers. December, Delegates of the All African Convention (AAC), representing thirty-nine organisations - including three provincial sections of the African National Congress (ANC) - adopts a constitution which invites the affiliation of all African religions, educational, industrial, economic, political and commercial organisations. The Executive Committee of the All African Convention (AAC) issues a statement regarding its policy. Constitution of the All African Convention (AAC) is drafted. The All African Convention (AAC) constitution is ratified. The AAC decides to meet every three years. The Third All African Convention (AAC) to promote the interests of Blacks convenes in Bloemfontein. Only 130 attend, a far cry from the 400 delegates that attended AAC's first meeting in 1935. Z. K. Matthews favours the disenfranchising of all Africans in order to promote unity. 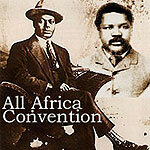 Matthews remains a member of the All African Convention (AAC) until 1943. Professor Davidson Don Tengo (D. D. T.) Jabavu is re-elected president of the All African Convention (AAC). A. P. Mda dismisses the ALL African Convention as devoid of substance and inspiration. Dr. Alfred Bitini (A. B.) Xuma, Vice-President of the All African Convention states that anyone who will endeavour to wreck the principle of unity that gave birth to the All African Convention will be doing so for personal reasons and will be a traitor to Africa. Yet the AAC has a lot of internal conflict. Despite the conflict, the All African Convention (AAC) proclaims itself the voice of Africans. It devotes itself to act in unity in developing political and economic power. Z. K. Matthews joins the African National Congress (ANC). July, The Executive Committee of the All African Convention (AAC) and the African National Congress (ANC) meet and pass a resolution regarding World War II. They sympathise with the British Commonwealth and urge the South African government to give full recognition to the Africans participating in the war. December, The All African Convention convenes with sixty delegates. The delegates include Rheinallt Jones, who was elected to the senate representing Africans in the Transvaal in 1937. Professor Davidson Don Tengo (D. D. T.) Jabavu refuses to give his opinion regarding World War II. At the top of the Agenda is All African Convention (AAC) and African National Congress (ANC) relationship. There is an overlap in membership. Z. R. Mahabane replaces Dr. Alfred Bitini (A. B.) Xuma as president of the AAC and Mahabane replaces Dr. Alfred Bitini (A. B.) Xuma as vice president of the ANC. The two organisations reach an agreement that the ANC shall confine itself to the political aspirations and constitutional rights of the Africans and other cognate matters while the AAC shall be the co-ordinating and consultative committee of African National organisations dealing with social, educational, economic, political and industrial matters. Soon after I. B. Tabata's criticism of the AAC, Dr. Alfred Bitini (A. B.) Xuma vice president of AAC in his presidential address states that the African National Congress (ANC) bears part of the blame of the AAC's weakness. He further mentions that the AAC has burdened itself with a federal constitution, meetings every three years and has made no attempt to establish any branches of the main organisation. Professor Davidson Don Tengo (D. D. T.) Jabavu criticises the format that the All African Convention uses for the election of its leadership. June, I. B. Tabata issues a statement calling all Africans, extending his invitation to Coloureds and Indians, an AAC conference in December 1943. the invitation is extended to other races as a show of unity against the oppressive White government. July, The All African Convention (AAC) of the Western Province drafts a manifesto. 6 July, I. B. Tabata requests Professor Davidson Don Tengo (D. D. T.) Jabavu to attend a meeting AAC of the Western Province in Cape Town to discuss the manifesto. 11 July, The All African Convention (AAC) of Western Province takes place. August, This manifesto is redrafted as " A Call to unity." September, Professor Davidson Don Tengo (D. D. T.) Jabavu sends a copy of the manifesto to Rheinallt Jones. November, Rumours that Dr. Alfred Bitini (A. B.) Xuma is to quit the All African Convention (AAC) are rife. December, Seventy-two delegates, including Indians and Coloureds attend the All African Convention (AAC). It coincides with the first meeting of the Non-European Unity Movement (NEUM). The meeting of the two organisations takes place in Bloemfontein and is chaired by Professor Davidson Don Tengo (D. D. T.) Jabavu. 16 December, Backed by AAC secretary, T. I. N. Sodlo and the Anti-Coloured Affairs Department member Janub Gool, I. B. Tabata protests that the AAC should be recognised as the official mouthpiece of the Non-European community. Delegates at the convention urge the African National Congress (ANC) in the name of unity to come back to the AAC so that the unity that was demonstrated in 1935 and continued in 1941 should be recovered and improved upon. 7 July, The All African Convention (AAC) meets in Johannesburg. Professor Davidson Don Tengo (D. D. T.) Jabavu is uncomfortable with the AAC and Non-European Unity Movement (NEUM)'s boycotting the Natives' Representative Council and parliamentary elections. December, The All African Convention (AAC) meeting fails to take place as initially arranged by the Executive of the AAC. Wycliffe Tsotsi replaces Professor Davidson Don Tengo (D. D. T.) Jabavu as president of the AAC. May, Professor Davidson Don Tengo (D. D. T.) Jabavu write to General Smuts wishing him well for the forthcoming election, something which would have angered I. B. Tabata had he known about the letter. June, I. B. Tabata writes to Nelson Mandela of the African National Congress Youth League (ANCYL) trying to win him over to the AAC. 3 October, I. B. Tabata is one of the signatories to "A Call for African Unity". Others include Professor Davidson Don Tengo (D. D. T.) Jabavu, Dr. Alfred Bitini (A. B.) Xuma, Z. R. Mahabane, R. V. Selope Thema, Dr. James Sebe (J. S.) Moroka, Z. K. Matthews, Allison Wessels George (A. W. G.) Champion, Paul Mosaka, R. H. Godlo, R. G. Baloyi, R. T. Bokwe, and L.K. Ntlabati who are protesting against apartheid and its dangers to African education, freedom of movement, land and residential rights, and employment opportunities. The proposed solution is "the unification of the main African political organisation, AAC and the African National Congress (ANC), into 'THE ALL AFRICAN NATIONAL CONGRESS' united and inspired by common principles and a common programme of action for the achievement of the liberation of the African people"
17 November, Tension between members of the All African Convention (AAC) arises. The AAC members at the joint conference with the African National Congress (ANC) cannot find common ground on issues pertaining to the running of the organisation. The AAC rejects the " Call for African Unity" proposal. December, Professor Davidson Don Tengo (D. D. T.) Jabavu bows out of the political scene thus paving the way for a younger generation. This was a small price to pay for his disloyalty to the pro-boycott principles of the All African Convention (AAC) and Non-European Unity Movement (NEUM). 17 April, A second joint conference between the All African Convention (AAC) and the African National Congress is held. The conference also fails to form a union between the two organisations. The All African Convention (AAC) slowly ceases to be an organisation as most of its old guard retires from active politics and a young brigade joins ranks with the African National Congress (ANC) and the Communist Party of South Africa (CPSA).